We can design a 3G synthetic pitch specification for your organisation which meets your requirements and gives you a great quality artificial grass sports facility to enjoy. 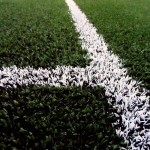 This type of synthetic grass pitch surfacing is typically used for football and rugby, so it’s important that the performance characteristics of the surface meet the requirements for these sports. The 3G synthetic pitch specification starts with either an engineered or dynamic sub base which ensures that the surface is porous to allow water drainage, as well as providing even foundations for the artificial grass to be installed onto. We usually recommend that a shockpad is installed beneath the 3G grass carpet, especially if the facility is being used for rugby as the shockpad provides impact absorption to help protect players from injury. Once the artificial grass surfacing has been installed, the next part of the 3G synthetic pitch specification is the sand and rubber infill, this provides the natural playing characteristics for rugby and football and helps to cushion players’ joints and muscles. You also have the option to choose additional equipment and accessories as part of your 3G synthetic pitch specification. These extra installations could include fencing in a range of heights from 3m-5m, and floodlighting in a number of different designs to suit individual budgets. It’s important to consider all the available options when you’re looking to carry out a 3G synthetic pitch installation, this will make sure you get the best possible artificial grass sports facility for your organisation, whether it’s a school, club or leisure centre. The designs for 3G artificial surfacing can be tailored to suit a range of area sizes and 3G synthetic pitch specifications so you can completely customise the whole installation process. You can choose to construct a facility which is solely for football or rugby, or a surface which is line marked for both of these sports to give you a bit more variety. 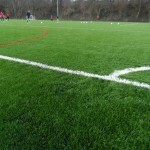 We can offer flexible quotes for a wide range of 3G synthetic pitch specifications so you can have full control over the installation process as well as your budget. As 3G artificial sports surfacing is becoming very popular in the UK and many organisations are choosing to replace old muddy natural grass pitches with more durable synthetic surfaces, these 3G pitches are a great investment for any school or club. A top quality sports facility with the latest 3G synthetic pitch specification can be used for recreational and professional use, as well as giving you the option to rent the facility out in the evenings to help increase revenue. We aim to offer great value sport surfacing products and services which give great performance characteristics and provide a safe sports facility for everyone to use. The designs for each project will vary so we can help you to come up with a truly unique sports facility which suits your requirements in terms of space and budget. Please get in touch with us to ask questions or submit an enquiry with regards to the 3G synthetic pitch specification and we’ll come back to you with professional advice.